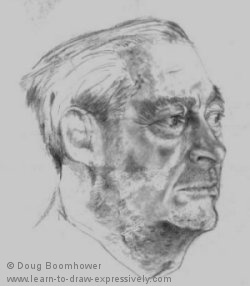 When you draw lifelike pencil portraits using live models, there is a psychological connection between you and the sitter. Your model, or sitter, should be comfortable with you and you should be comfortable with your model. You can't draw under pressure. Have you ever had somebody sit for you while you drew a portrait of them? As you scroll down, you are sure to pick up some pencil drawing tips. All of the following drawings were done from live models. Professor McClosky sat for me in 1995. I thought his face had a lot of character so I approached him to sit for me. He was always deep in thought, and I tried to capture that in the drawing. I can’t overemphasize the importance of light and shadow in order to capture expression. This entire portrait was done in pencil. I used Staedtler Lumograph drawing and sketching pencils, ranging in weight from B to 4B. The darkest parts of the drawing were done with 3B to 4B pencils. The majority of my drawing was done with 2B and 3B pencils. Edges are softened with blending stumps (in the case of charcoal, I use brushes as well as blending stumps). I darkened my basement, (which served as a studio at the time) and then arranged the lighting. Notice how important a part the lighting plays in this portrait. Both the sitter and I were happy with the end results. Notice the powerful feeling you can capture, with the proper use of just pencils. 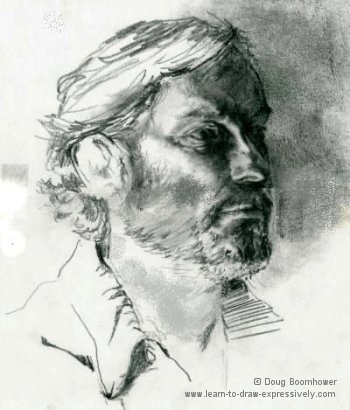 Fellow artist and friend, Les Potter sat for me in 1995. 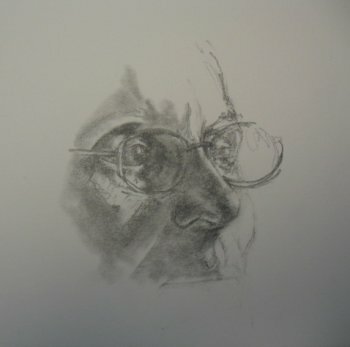 This portrait pencil drawing is not quite finished, but I like it because it captured Les. 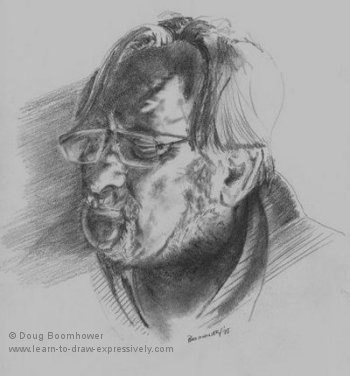 This is a portrait pencil drawing of a long-time friend and musician, Terry Dubek. The drawing on the left was done initially to familiarize myself with the contours of his face as he sat for me. (This is one of my favourite life drawings...I like the spontaneity and the feeling so quickly captured.) This entire drawing is done with a 2B and a 3B pencil and a blending stump. It was done on Meridian paper. Notice the subtlety, and at the same time the significance, of the eyelashes in each drawing. They were drawn with a kneaded eraser. Note the lighting on the forehead in the final piece on the right...how the highlight on the forehead melts into the background. Your eye completes the edge of the forehead even though a line does not exist. This means as a viewer, you are actively participating in the image. Viewer participation is an incredibly powerful tool, which makes the observation of that image a more meaningful experience. In order to draw lifelike pencil portraits, I asked friends or acquaintances to sit for me. Here are more examples of detailed pencil drawings. 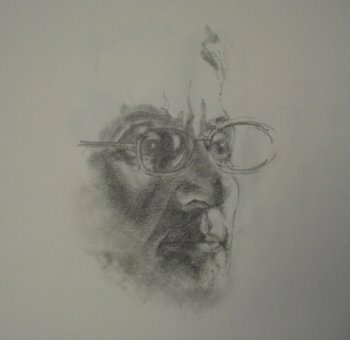 This is an unfinished drawing of the late Gordon MacDonald whom I met through a very close friend. Gordon was a Bazilian Monk and Philosophy professor. He was interesting to draw, particularly because he had so much to say. I don't think there was a book in the world he hadn't read. The look that was captured in his eyes was a combination of his discomfort posing, combined with the next thought he was formulating in his mind. 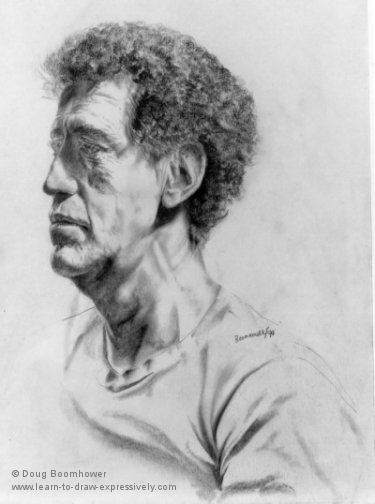 When I draw lifelike pencil portraits, I can learn a lot from the people who are sitting for me. Once my sitters become relaxed, they often open up and tell interesting stories. When I am drawing sketches of people, I always let them know when I begin working on their mouths ... it is the one time they can't talk! 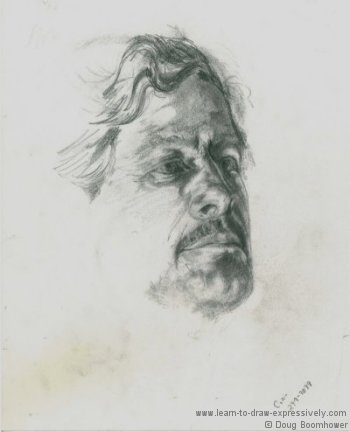 This is a drawing of an extremely interesting man, Bill Hudson, whom I got to know when he was renovating my house. Note the details throughout the face, and the realism of his hair. This is a drawing of my friend, Bob Fink, who plays an important role in community politics. He is an artist, a thinker, and a wonderful writer. 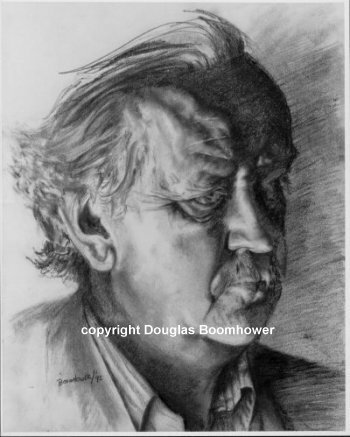 This drawing was done relatively quickly over a few sittings, during which he was constantly reading. When I draw lifelike pencil portraits, lighting plays an important role. Notice that the eye on the left is only suggested. This suggestion has been carefully planned. Suggestion creates more interest by leaving things out and letting the viewer fill in the blanks. This, however, is most effective when balanced against detailed sections. 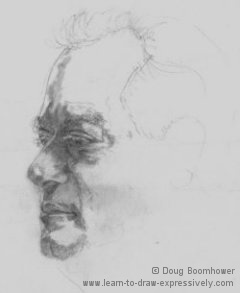 To draw lifelike pencil portraits, I find that the balance between suggestion and detail creates a strong sense of realism. 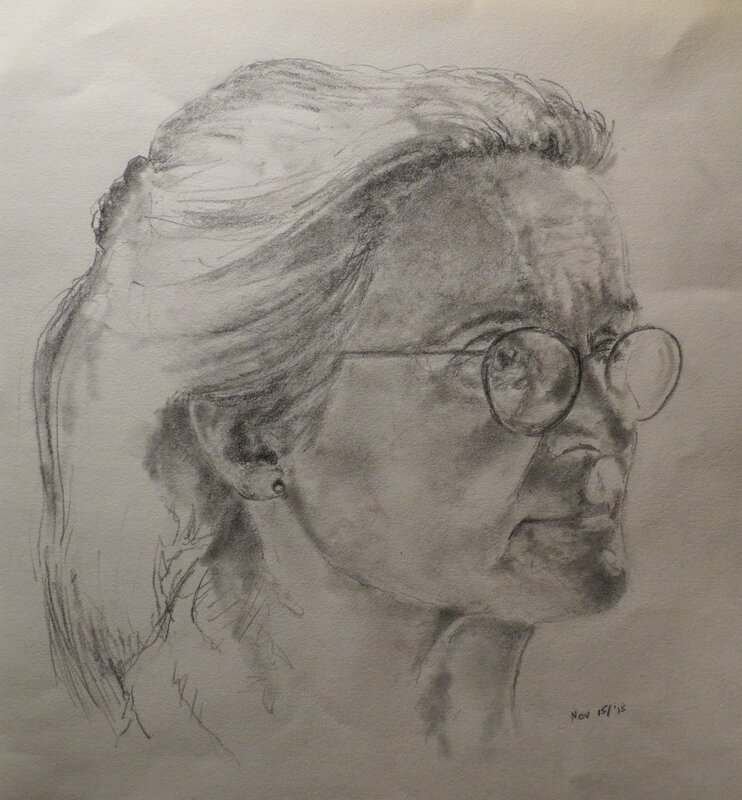 When learning to draw lifelike pencil portraits, live models are your best subject matter. I started doing some drawings of my wife. She's a great study for an artist who wants to learn to draw a face quickly because she tends to fall asleep when she's modelling for me. This was done in about 20 - 25 minutes ... of course the advantage of working quickly is that it improves eye-hand coordination. The next night I did another drawing using the same pose. This time I worked close to an hour before she nodded off. Another pencil drawing of my wife. She sat for me over two nights ... total time approximately one and one half hours. Great practice! It looks just like her. Another one of my wife ... done in 30 minutes. 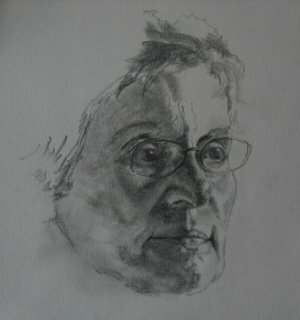 The most recent drawing of my wife ... done over two sittings, about two hours in total. 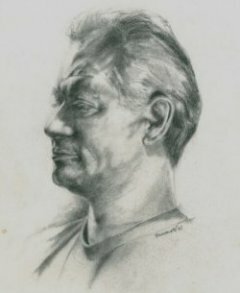 to Draw Lifelike Pencil Portraits? 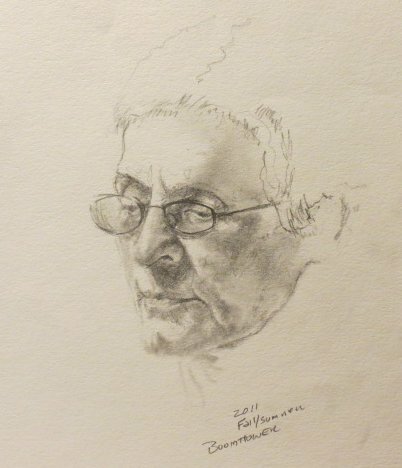 Do you have a story to tell about a portrait you have drawn? Was it a drawing of someone close to you, was it a family member, or was it just a willing subject? Share your story! Just type and your story will appear on a Web page exactly the way you enter it here. You can wrap a word in square brackets to make it appear bold. For example [my story] would show as my story on the Web page containing your story. Do you have a picture of your drawing? Great! Click the browse button and find it on your computer. Then select it.